With factors such as scarcity, aging infrastructure, and water quality driving the price of municipal water higher, businesses are increasingly considering other means of securing supply. This article examines the trend toward alternatively procured process water and its impact on municipal and commercial interests. One of the most indispensable utility resources in the U.S. is the water supply. Consequently, developing and coordinating programs that will provide some degree of water conservation is essential. The nation’s demand for water has increased over the past decade, as households and businesses continue to depend on a reliable, clean supply of water for drinking, agriculture, industrial production, and other high-volume applications. One solution relating to water efficiency is the use of process water. 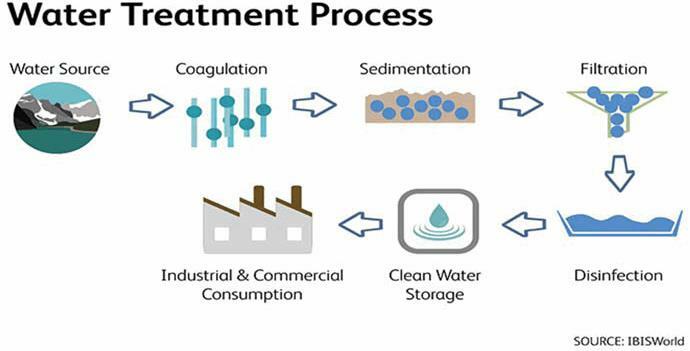 Process water — an emerging alternative to traditional water supply consumption — is the supply of treated or recycled fresh water from an owned source, or surface water from a nearby river that is purified by the users’ upstream filtration system. In many industrial and commercial processes, the use of process water allows businesses to increase water consumption without shrinking the nation’s water supplies. Moreover, process water is likely to be less contaminated than the water sourced from public distribution systems, which can pick up lead and other contaminants from aged pipes. Given the breadth of industrial and commercial processes in which the use of water is integral, and because reserves are shrinking, the need to identify an alternate resource is imperative. Though outsourcing process water has been cost-effective for end users, suppliers have been met with heightened production costs as strengthening demand has prompted upstream suppliers to raise the price of inputs. This trend has been causing the price of process water to rise during the past three years. As a result, users are currently facing a dilemma where they must decide whether to continue procuring from existing producers or begin producing process water in-house. The National Oceanic and Atmospheric Administration and the U.S. EPA have found that the average annual rainfall has been declining consistently since 2007. The EPA attributes this trend to climate change and expects that water supplies will continue to shrink as a result. In response to the EPA’s findings, public and private water supply distributors have sought to curb the nation’s water consumption by raising prices. However, in spite of increased water utility prices, the use of water supply has steadily inched upward. Given the ineffectiveness of these price hikes, a number of other conservatory measures have been implemented. These efforts have primarily focused on employing water reuse practices and reducing waste, with one of the more promising practices being the use of process water as a substitute. Not only does process water allow for the reduction of traditional water consumption among industrial and commercial businesses, but it is also a cheaper alternative to water received from public and private reservoirs. EPA studies have shown that the water sourced from public and private distribution systems has been accumulating increasing amounts of rust due to aging pipelines. As a result, the EPA now requires that water leaving a city’s water plant be tested for microorganisms (e.g., Cryptosporidium and Legionella) that thrive in aged piping systems. In effect, locales (e.g., Oakland, CA) are collectively spending around $50 billion each year purifying the water in their distribution systems (this is considerably less expensive than replacing their aging infrastructures). High amounts of lead have also been identified in a number of municipalities. To protect themselves, a number of commercial firms have agreed to increase their use of process water. For example, the food and beverage industry uses public water for many purposes. Operators in this industry have a major stake in ensuring that water used in their processes is of high quality and purity, since it is used to make products that will be consumed. Moreover, water is also used to clean and sanitize floors, processing equipment, containers, vessels, and the raw food products prior to processing. Given the breadth of industrial and commercial processes in which the use of water is integral, and because reserves are shrinking, the need to identify an alternate resource is imperative. Water supply conditions have been spurring a dramatic increase in demand for process water in the past three years; however, suppliers have not been equipped with the reserves to meet this demand growth. Further, process water suppliers have incurred higher operating costs. In response to sales growth, upstream suppliers have raised the price of integral inputs and equipment used in the process water production process. Consequently, to protect their profit margins, process water suppliers have been passing their heightened production costs on to buyers in the form of higher prices. Downstream suppliers that have negatively affected bottom lines include water treatment chemical suppliers, water quality testing equipment suppliers, water well drilling service providers, and water hauling and vacuuming suppliers. For example, the price of water treatment chemicals is influenced by the production of process water because water softening compounds and demulsifiers are integral inputs used in the process water production process. According to IBISWorld, the price of these inputs and other water treatment chemicals increased 1.0 percent in 2016 and is projected to grow at a slightly faster pace in 2017, thereby making it more difficult for process water suppliers to expand production levels to satisfy demand growth. Similarly, IBISWorld projects spikes in the price of water trucks, which are used to store and transport process water. This trend will hinder suppliers’ ability to control their overall costs. 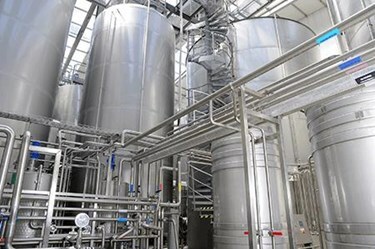 Because the price of sourced goods and services will negatively affect suppliers’ bottom lines, suppliers are expected to raise the price of process water. In the event that the spike in input costs persists and water supply rates continue to increase, industrial and commercial firms will look to other solutions, such as establishing water treatment facilities in-house, to offset continuous price hikes. In fact, in recent years, many large industrial firms that require significant quantities of process water have turned to building on-site process water facilities, bypassing the need for outsourcing. Unfortunately, this method is often not cost-efficient for all buyers. For low-volume water users, this alternative is costly and therefore not a practical solution. Although municipalities have every intention of building low-cost, high-quality water supply systems, the constant delay and its impact on the existing water supply systems are expected to make it less feasible to do so. According to the American Water Works Association, to replace all pipes in the U.S. today, water utilities would have to invest $250 billion to $350 billion over the next 20 years. If the investment isn’t made soon, this cost could triple by 2030. However, demand for process water is expected to expand in the next three years alone, causing prices to rise as a result. Growth in the price of process water will, in turn, prompt more investments to be made in in-house water processing. Deonta Smith is a lead procurement research analyst for IBISWorld, specializing in construction and infrastructure. He holds a bachelor’s degree in economics from Pepperdine University. The research featured in this article can be found at ibisworld.com/procurement.